Love the shine of his hair. Saitouuuu ~ <3. I love how he draws his sword. i have never seen this but this is hawt! OMG? MANGA? ANIME? WHAT'S THIS? he's sooo handsome! i'm gonna watch it soon! I love this series - thanks for sharing! He is hot, I love his hair and his sword, I wish this was an anime. Thank you for this scan! will they EVER consider making this game into an anime?! omygodd..i wish it will! so handsome O_O thanks for sharing! This is a beautiful picture. Thank you very much for posting it! Keep up the great work! Great quality! Thanks for sharing it! This is a so beautiful picture. Thank you very much for posting it here! Keep up the great work! very nice! so gret keep up this wobderful job! 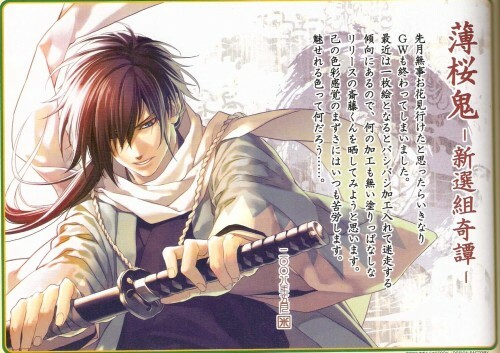 but the most is, saitou~~ you have an handsome face~!